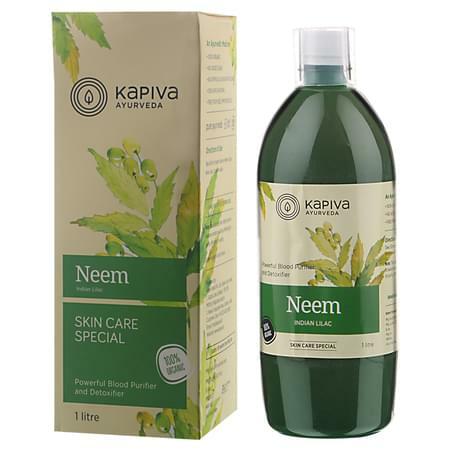 • Kapiva’s Neem Juice brings the natural goodness and medicinal splendour of neem. • Cures indigestion, constipation and restores chemical balance in the stomach. • Fights hyperacidity and epigastric pain. • Fights intestinal worms and keeps the digestive system free of harmful parasites. • Cures urinary tract infection. • Stimulates liver function and secretion, making the blood purification process more efficient. • Skin disorders can be put to rest through daily consumption. • Acts as an anti-inflammatory and pain-relieving agent. • consuming 30ml of this juice with 30ml of water, twice a day, can work wonders for your body. • Kapiva derives its name from the three doshas of ayurveda – Kapha-Pitta-Vatta. our range of 200+ GMP Certified products have the right herbs in the right dosage and provide solutions to a variety of ailments. it's the day and age of hybrids, so go ahead and enjoy the best of both worlds - Ayurvedic tradition + Modern-day science and technology.